See this show before it vanishes! 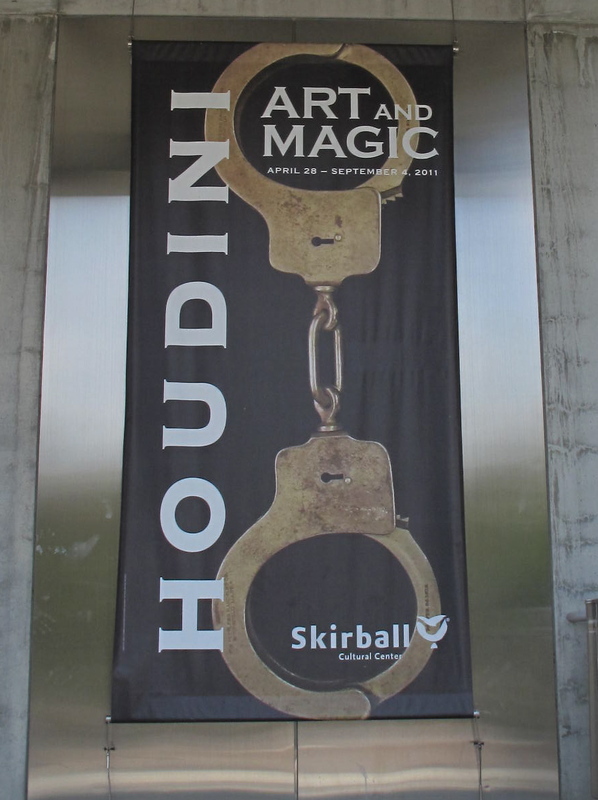 We’ve seen Houdini: Art and Magic at the Skirball Cultural Center twice, and we’d like to go again before it closes this weekend on Sunday, September 4th. I think Houdini: Art and Magic is the perfect museum family exhibition, in part, because magic is such a captivating subject. When I told my sons we were going to see a museum exhibition on magic, going to the Skirball was an easy sell. Our first trip to see the Houdini show was on a Thursday afternoon in early July. Note that admission is free on Thursdays, including the ever-popular Noah’s Ark — an activity space ideal for toddlers too young to enjoy the exhibition. As we entered the dimly lit gallery space, my sons (ages 7 and 9 yrs) were instantly drawn to a larger-than-life video image of Houdini hanging from a rope upside down performing one of his death-defying escapes. There are so many different types of objects and media on display throughout the exhibition. This multi-layered approach gives families a variety of entry points into the extraordinary world of Harry Houdini. We explored images of Houdini through media footage like vintage clips of his thrilling performances, scenes from his silent movie appearances, and even T.V. segments of modern-day magicians performing Houdini-inspired stunts, like David Blaine breaking the record for holding his breath while inside a water torture cell on the Oprah show. Three-dimensional objects brought Houdini’s masterful escapes to life for the kids– particularly, an incredible glass, metal, and wood reproduction of Houdini’s famous water torture cell, a display of turn-of-the-century handcuffs, and an actual straitjacket from 1915. Houdini’s fascination with straitjackets began when he visited a psychiatric ward and observed patients struggling desperately to free themselves from the restraining devices. Artists’ works and interpretations “conjured”up intriguing images of Houdini’s magical abilities. Japanese artist Ikuo Nakamura’s Materialization (2009) piece, based on the Houdini’s milk can escape, captivated our entire group. Standing from the right angle, we saw an eerie electric green hologram image of Houdini’s handcuffed hands trying to escape out of the top of a large vintage tin milk container. We learned a lot about Houdini by reading wall labels as well. My 9 yr old actually did read labels for the first time. Honestly, I had to hurry him along towards the end to meet up with our friends who wanted to see Noah’s Ark. The wall labels contain interesting tidbits on all phases of Houdini’s life. But the label content on Houdini’s early years is particularly engaging for kids, especially for boys like mine who wonder how and why someone becomes a magician. Houdini’s insatiable childhood sweet tooth drove him to break his first lock, the one on his mother’s locked cookie jar. He continued this boyhood mischief by unlocking the doors of shops on Main Street after closing time. Because my kids were unfamiliar with Harry Houdini and his impact on the world of magic, we spent a little time reading about him on the Internet before we left for the museum. We liked this website, The Great Harry Houdini, the most. This brief introduction spurred my kids’ curiosity about Houdini and really enhanced their museum experience. Several times, my kids excitedly pointed at Houdini artifacts and magic performances that they recognized from the Web. Although there is a lot to see, the number of objects and the overall size of the exhibition are quite manageable for families. You can spend under or over an hour going through the exhibition depending on the age of your children. 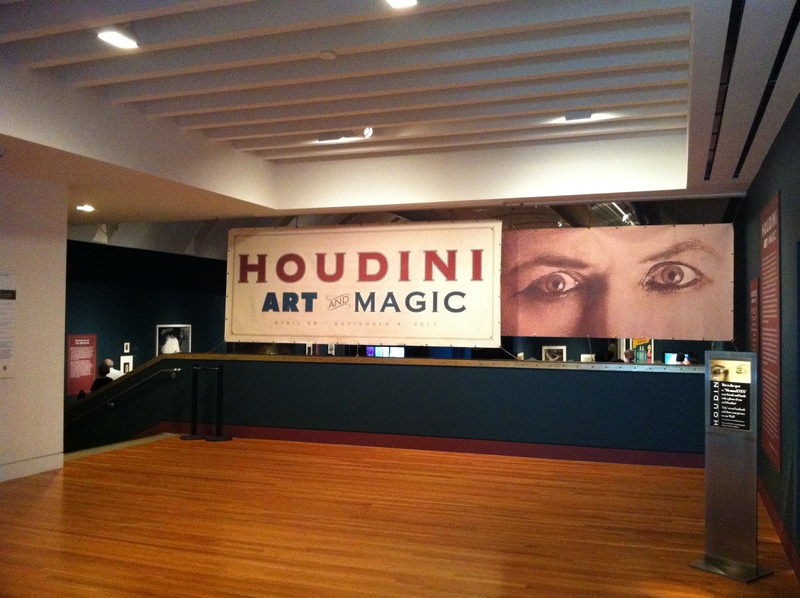 So set aside an hour or two out of your busy Labor Day weekend to enjoy the last days of Skirball’s Houdini show. I think you’ll find it nothing short of magic! Posted in Exhibition Reviews, Skirball Cultural Center. Tagged as exhibition review, family activities, Harry Houdini, kids activities, Los Angeles Museums, Skirball Cultural Center, things to do in L.A.